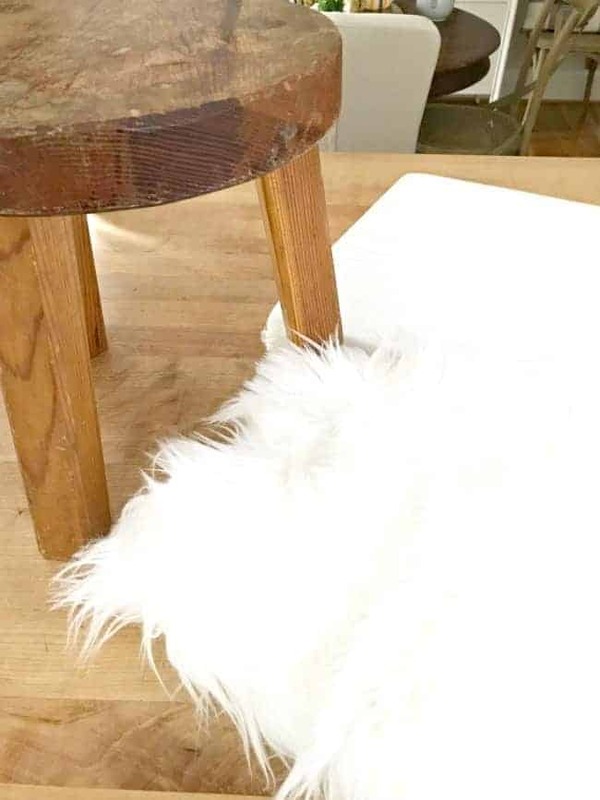 How to turn a thrift store find into a cool faux fur stool. Anyway, it’s that time of month where the Thrifty Style Team gets together to share their thrifty finds. Make sure you check them out at the end of the post. 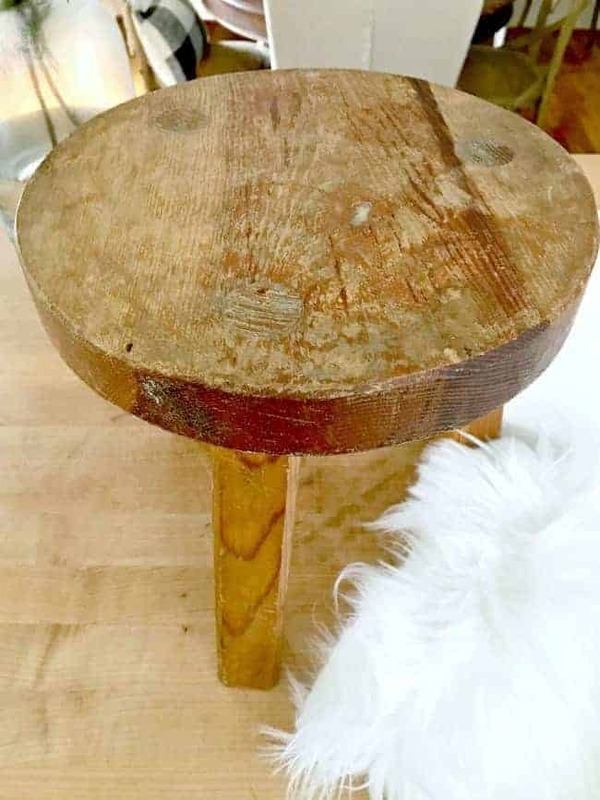 A few weeks back I was browsing through one of my favorite thrift stores when I found this little old wood stool. Was I looking for a stool? Umm…no. Did I need another stool in my life? Not exactly, but it was only $2 and I loved it. Nobody was with me to talk me out of it (yes, the hubs would have talked me down), so it came home to live with me. It went right into the sunroom, where it sat while I tried to figure out what to do with it. At first I was going to leave it. Then I decided that I wanted to paint it. In the end though, a spare piece of faux fur completely changed my mind. I had the stool and the fur. All I needed was a piece of foam to add a bit of a cushion. This is such an easy project. I think it took me 10-15 minutes to do the whole thing. To start, I drew a template of the stool seat on the foam and cut it out. After I cut out the template, I turned the stool over and positioned my fur so that it would cover the seat and foam. 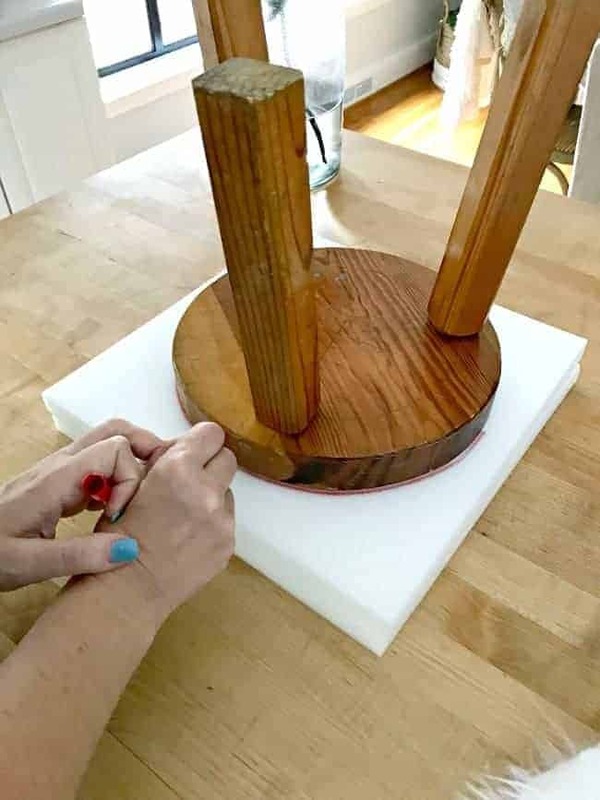 Then I started stapling the fur to the underside of the stool seat. There was no fancy formula to this step. I just pulled the fur tight, without moving the stool, and stapled all the way around. Ten minutes and the stool had a cool new head of hair. I think the faux fur was definitely the way to go. I thought about painting the legs but decided to leave them for now. I’m loving it in the newly redone sunroom. It’s such a fun addition. I even sit in there petting it. Don’t forget to check out what my friends on the Thrifty Style Team are up to this month. They never disappoint. 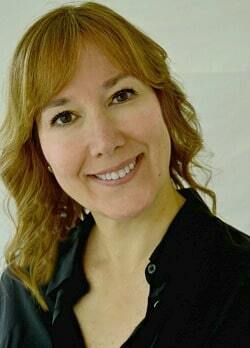 Previous Post: « An Apology…and a Thank You! That is so cute, Kristi! I’ve been thinking about doing the same thing to a little stool in our master bath. Love it! That is adorable! Disappointed I don’t get to see your hubby modeling it though. Well, drat! Oooh there’s some pretty fur there!! Beautiful work. I was at World Market the other day and saw a similar stool w the fur priced over $100!!! 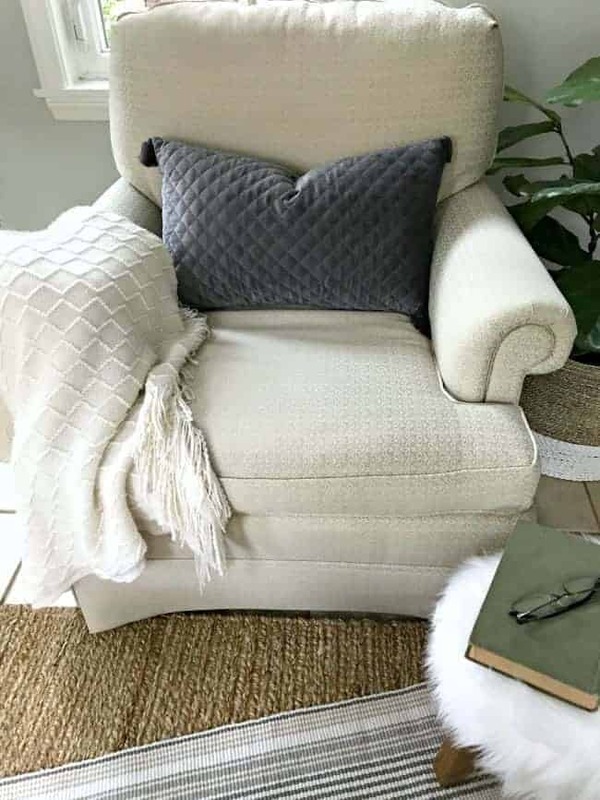 I am so in love with this cozy lil footstool you made! My husband just caught a glimpse of the computer screen and came back over to check out your furry lil footstool too, he liked it very much!! I enjoyed seeing your Hubs in the IG stories too! Mine is the same, he says never, ever put any photos of me on IG or FB! LOL Have a great weekend! oh i love your new puppy….I mean cute stool. Ha, i had to laugh when you said you were petting it. what a great find and a great transformation. So cute and you can never have too many stools! Great find. I love your new pet, lol!! Seriously the cutest project ever and now I need one in my sunroom ???? Thanks so much, Cindy! I love how it turned out. Brilliant and i love your stool. I have stools now all i need is fur and deciding which one to use. Thanks so much. Please let me know when you will be out as I am coming over to steal that stool. I might sand up the legs and whitewash them though 🙂 Ok, fine. I may have to make one if I can find a great stool and figure out a place for it. You are a brilliant person. I just found another stool, different shape, that’s waiting for it’s transformation (I did say I had a stool addiction. 😉 ). Thanks so much for the laugh, Jillian. That stool was just destined for a more glamorous life! I love it! It’s definitely more glamorous. 😉 Thanks so much Vanessa! Cute, and looks just like the $50. 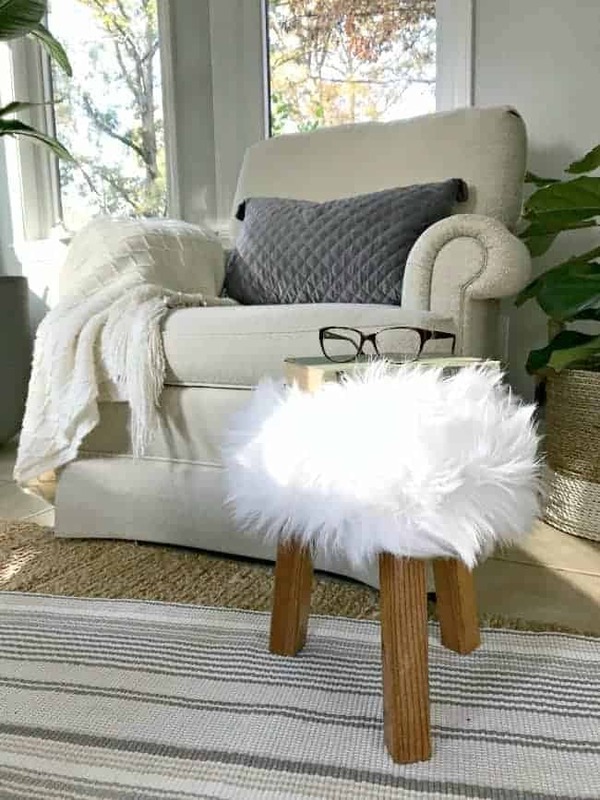 fur stool selling at some stores. Haha…petting it. I totally would be doing the same thing. And it doesn’t even need to be walked or fed. 😉 Love it. First, I love wooden stools! Second, what a great job. I usually just leave them but this is adorable. Finally, that looks gorgeous in your room. That is really cute, but you know, I sort of like it in it’s rustic naked wood state too. The new way will be much softer on the tootsies however. Oh my goodness! Your fur covered stool is as cute as can be! I will definitely be on the lookout for a similar stool! $2.00? And the faux fur looks beautiful! The stool really is cool and looks wonderful in your sunroom! Great transformation! Thanks so much for this tutorial. 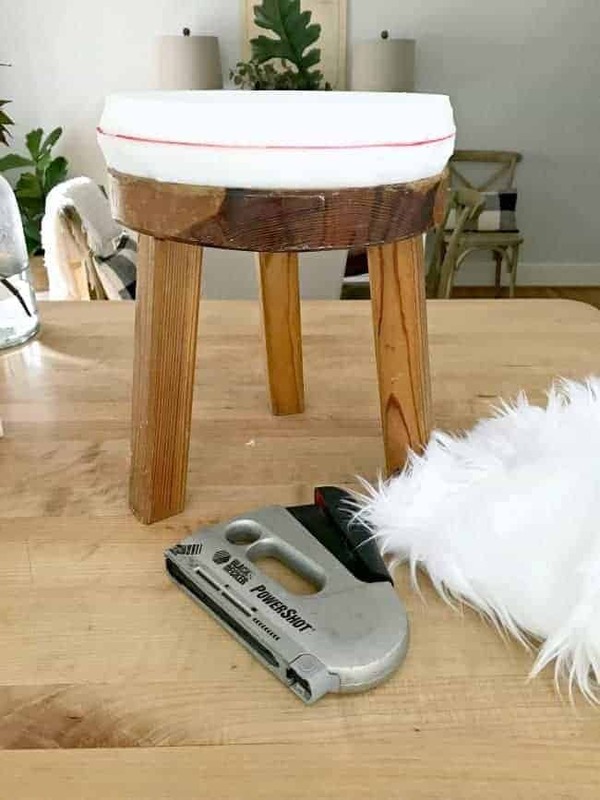 I actually have a stool and fur already, so I will definitely do this myself!